Yesterday we flew Roy Mueller's SkyBow vertically under the Gomberg Falcon. We were able to walk around a wide arc testing different angles and shapes. Only when the radius of the arc became too tight did the SkyBow stop spinning. 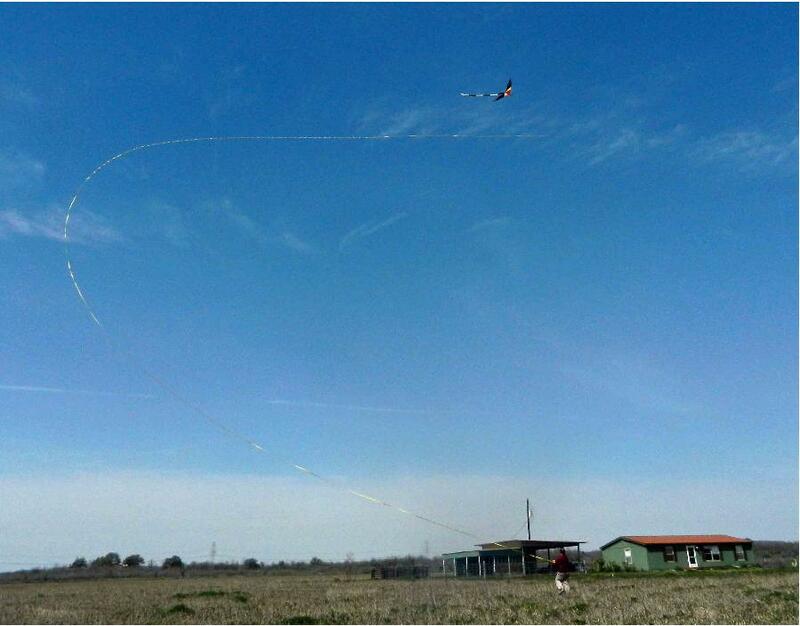 The 250ft SkyBow Pro experienced a nice boost by being lifted higher. The Pilot-Kite also made launching and starting the SkyBow easier. In effect, we created 1/2 of a 500ft SkyBow arch which might someday usefully feature a Pilot-Lifter at its center. There was a lot of empty space in our configuration to festoon the sky with multiple SkyBows in peacock arrays. We will be adding a generator next, but for now we judge the power by lightly pinching the shafts at the swivels, and feeling the heat. Its clear there is a few watts just waiting to be tapped, but how to judge the raw efficiency? The ribbon is about 2cm wide by 80m long, so that comes to just 1.6m2 of wing. To extract 10W in a good breeze seems doable, at fairly low total efficiency (~10%, compared to ~30% for a normal power kite. Careful testing will tell if these ~informed guesstimates hit the target.